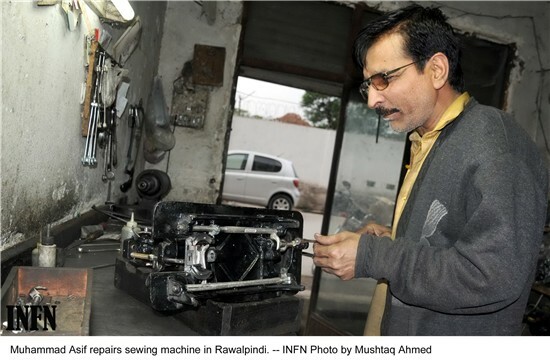 Muhammad Asif, who repairs sewing machines for a living, is happier than most employed men. He believes that if one learns any trade or work with keen interest he can be successful in life. He became a successful sewing machine technician by a stroke of luck. Earlier he did not have any goal in his life. Once he was reading a newspaper in which he came across a classified advertisement titled 'Sewing Machine Repair Course' offered by an institute at Urdu Bazaar, Rawalpindi. He learnt the art and practiced his ability there for four long years, which finally made him capable of starting his own business. Now big companies hire his services due to his sincerity and quality of work. In addition to it, people come to him to get their sewing machines repaired. "Learning this art was of course difficult, but it was not impossible. I learnt repairing and assembling sewing machines in a short time. Today, with the grace of Almighty Allah, I am very happy with my work," Muhammad Asif told Infochange News and Features Network (INFN). Asif, 50, has been in this business along Jehangir Road, Rawalpindi, for three decades. "I assemble two sewing machines every day for which I get Rs500, besides fixing old machines. I am a man of principles and I don't overcharge from my customers. I tell them straightaway reasonable charges depending upon the nature of the fault in the sewing machine," he said. He opens his shop at 10 a.m. and closes it down at 11 p.m. daily. He remains busy in his work most of the time. Sometimes his friends visit him, whenever they are free, for chitchat. He is a diehard cricket fan and his friends are quite fond of his witty remarks on the game. He said that there was a time when he used to earn Rs50 per day, which were sufficient for the needs of his family. “Now I earn at least Rs500 per day, but this amount is not enough for the needs of my family due to the unprecedented inflation,” he added with a wry smile on his face. He said that the government should do away with the practice of giving permanent jobs to retired persons. “The number of unemployed persons is swelling due to this practice. Talented young people are in search of jobs, but to no avail,” he said. Muhammad Asif said that there is no harm in learning and practicing any art. "Young people should acquire education as much as they can, but they should also learn something practical. It pays in the long run and one can start his own work whenever its need arises. "Success in life needs hard work and dedication. We should not give up no matter how tough it gets?" he explained the philosophy of his life in simple words.